When I moved to L.A. from the East Coast, I was floored by how much it defied every stereotype. There were so many neighborhoods and corners to explore, so much diversity, and an abundance of fantastic food experiences, but it wasn’t until I came to know Boyle Heights that I felt like I finally found the real L.A. I was looking for a new documentary project when a mutual friend introduced Eric Waterman to me. 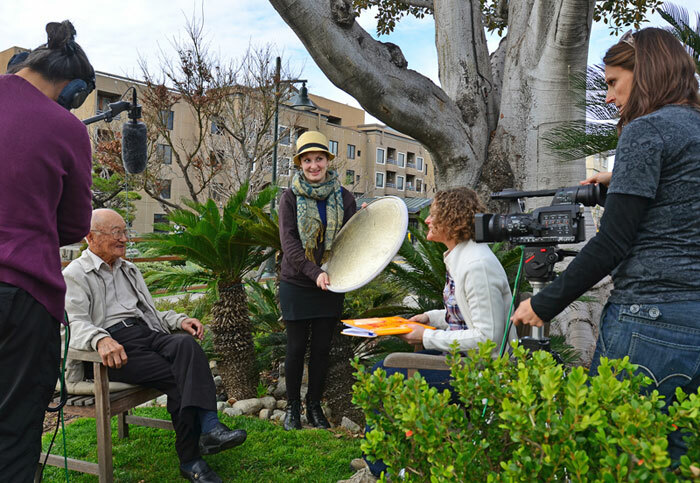 Eric had an idea for a documentary kindled by his parents’ pride in growing up in Boyle Heights. He wanted to tell the story of this “Ellis Island of the West Coast” and give it its due place in history. I knew a little about Boyle Heights already because it had once been home to the largest Jewish community west of Chicago and my cousin taught at Murchison Street Elementary School there in the 1960s. However, nothing prepared me for how Boyle Heights would permeate my life during the next nine years. It got under my skin in such a profound way that I found myself falling in love with the place. In researching East LA Interchange, I was first drawn to the activist history of Boyle Heights. I loved that this neighborhood became a hotbed of radical activism in Los Angeles because of discriminatory housing policies. L.A.’s prevalent racially restrictive housing covenants made Boyle Heights one of the few places in Los Angeles where Mexicans, Jews, African-Americans, Japanese, and other ethnic groups could rent or own property. Here, Eastern European communists and socialists were thrown together with Mexican anarchists and revolutionaries. Boyle Heights’ community activism originated in a shared awareness of discrimination and class; radical politics helped form a tight bond across racial and ethnic backgrounds and cemented the neighborhood’s status as a multicultural mecca. Boyle Heights’ unique history drew me in but what made me realize that I had found the theme for my documentary was examining from the 1970s to the present. Even as the neighborhood became predominately Mexican American, Boyle Heights remained committed to activism and fighting for its rights as a low-income, immigrant, community of color. Residents today are just as determined to make their voices heard regarding economic and housing opportunities, social and environmental justice, non-discriminatory immigration policies, industrialization, and gentrification. How can anyone not root for a neighborhood that has actively fought discrimination and neglect for over eighty years? Seeing how much our divided, contemporary society wrestles with issues of building and sustaining community, Boyle Heights’ cohesive community activism throughout the years fascinated me. I was moved by the endurance of this “dynamic, politically tolerant and community-proud neighborhood” and believe will inspire viewers here and in communities elsewhere facing similar issues. After watching East LA Interchange, my hope is viewers will allow Boyle Heights into their hearts. Imagine what would happen in this country if everyone went back to their own communities with the same respect and pride that the people in Boyle Heights have for their neighborhood. Imagine what the U.S. could be if communities like Boyle Heights worked together to secure our nation’s pledge of providing equality and justice for all.